The SMART Speaker Series in association with SMART Community Exchange (SCE) is now in production. From live events and select local venues, to an on-line presence that enables the worlds of social media and live performance to seamlessly meet, the ECE experience is about collaborative learning, discovering new business opportunities and unique contacts.The ECE is always open and just waiting to be discovered. The first Speaker Series in 2013 featured a number of highly regarded experts in the field of SMART Commerce. The lecture program has since expanded to include internationally renowned business executives, investors, entrepreneurs, policy makers, philanthropists, scientists, authors, media experts and other luminaries. The SCE has become a well-established and highly regarded highlight of the global commerce, and an integral part of the international business community. The SCE works closely with organizations around the planet to identify Speakers who have particular appeal for SCE's fast growing international audience of over 2 million business executives, values-based investors and donors, entrepreneurs, and policy leaders. The Speaker Series also addresses an important role of SCE's global mission - public service in the communities - by dedicating speakers to address education and other societal issues and concerns. 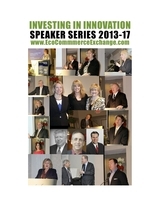 This speaker series is about bringing best practices to market. SCE brings together individuals and organizations in a way that does not require a large investment of funds and time. By pooling our contacts and resources, we can find new opportunities to bring innovations to market in a quick and efficient manner. Together, we can overcome market penetration challenges and remove barriers accelerating access to markets, funding and government approval process. Buildings typically consume 30–40 percent of all primary energy used. Over 80 percent of the environmentally harmful emissions from buildings are due to energy consumption during the times when the buildings are in use. Our concept of S.M.A.R.T (Sustainable, Measurable, Affordable, Resilient, Technology) means decreasing the number of components and materials, simplifying the design of necessary components and using the same component or system for different functions and optimizing the whole building, not the sub-units. Not only does S.M.A.R.T lead to investment savings but it also provides a more reliable system. We will utilize our unique portfolio of technologies in our SMART Building projects. The SMART IoT, and technologies such as sensors; geothermal equipment and heating/cooling air pumps for the ground source and drilling installation applications; Intelligent energy storage battery system developed for PV solar and wind power installations into national or regional electric distribution grids; networked power management; solar panels and thin films; solar heat collectors; electric car stations and battery swappings; vehicle to grid battery storage; onsite energy generation and storage; building information management; building automation systems; real-time demand management. These projects will result in cost-effective building that can reduce energy consumption, and also lead to improved indoor climate and air quality. Not only does S.M.A.R.T lead to investment savings but it also provides a more reliable system. Other principles include controlled ventilation and efficient heat recovery, improved thermal insulation and using structures as heat storage units. Based on our diverse competence in economically efficient and environmentally friendly construction, together we enable the construction. We aim to combine several technologies for entire new and advanced solutions in terms of sustainable development. We will develop a value network of partners that will enable the opening up new markets for large scale construction projects in the Americas, Europe and the emerging markets. To respond to this challenge, we have appointed a working group in Atlanta, Georgia, to investigate possibilities worldwide, to enhance the export of our SMART Building’ know-how into other markets. As a result, new SMART Building construction projects, ventures with financiers as well as regional corporate development organizations will be launched. The goal of these ventures is to build an operational model with the help of the companies, financiers, and public operators involved. We have conducted a preliminary market investigation about the nature and quantity of demand for ‘Low Energy Buildings’. Based on this investigation an operational model fitting for SMART Building construction projects for emerging markets has been drafted with the help of our experts. This operational model will be tested in negotiations with local governmental officials, research organizations and representatives of companies. The Better Buildings Initiative proposes to make American businesses smarter through a series of new initiatives including newly designed tax incentives for building efficiency, better financing opportunities for commercial retrofits, a “Race to Green” for state and municipal governments that streamline regulations and attract private investment for retrofit projects, a “Better Buildings Challenge” to CEOs and University Presidents, and, finally, new training for commercial building technology workers. An analysis released in June 2011 by the Political Economy Research Institute (PERI) of the University of Massachusetts at Amherst, showed that more than 114,000 new jobs, many of which would come from the hard-hit construction industry, would be created through the Better Buildings Initiative. Three energy efficiency strategies for buildings include: SMART grid, high efficiency windows and glass, , and lighting. If Home Star legislation is also passed, the firms involved in residential re-insulation and electric heat pump hot water heaters will also benefit.